Extraordinary stories of angelic appearances in the lives of ordinary people abound. Author Joan Wester Anderson brings together some of the most compelling true stories from the past five years in her latest collection, In the Arms of Angels. Whether they center on seemingly mundane events or national tragedies, the stories in this book reveal that angels accompany humans on their daily journeys and influence their lives. In a time when “nearly every institution in which we have placed our trust has faltered and collapsed,” these striking stories of heavenly intervention provide a glimmer of hope and a glimpse of eternity. In the Arms of Angels is simple evidence that, as God promised, angels intervene in human lives to offer guidance, aid, and consolation. I am going to send an angel in front of you, to guard you on the way. 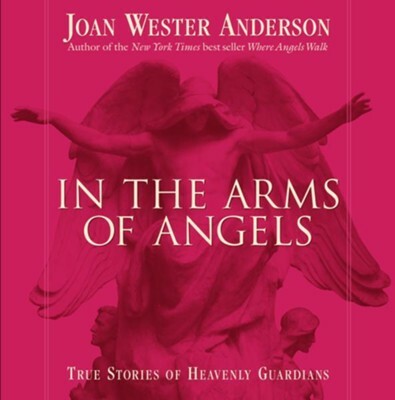 When Joan Wester Anderson wrote Where Angels Walk, millions of readers were captivated by her inspiring collection of true stories of angelic intervention. The book remained on the New York Times Best-Seller List for over a year. In the Arms of Angels is Andersons newest collection of mysterious and heart-stirring stories of heavenly guardians. From the harrowing account of a World Trade Center survivor to a miraculous rescue during the first Gulf War, these powerful stories invite us to take another look at the "coincidences" in our livesto open our eyes to the angels who walk beside us. "In times of uncertainty, we long to be reminded that, as Joan Wester Anderson writes, We are not alone."
"In the Arms of Angels is a true gem, a book to be treasured." I'm the author/artist and I want to review In the Arms of Angels: True Stories of Heavenly Guardians.